Streets North of Main St. Streets South of Main St. Please keep cars off the street when the sweeper is in your neighborhood. Additionally, due to heavy dust, it is advised to keep windows shut during these times. In honor of former Trustee Mrs. LaVern Johnson's lengthy and dedicated service to the Town of Lyons, the Board of Trustees (BOT) unanimously passed a resolution to change the name of Meadow Park to LaVern M. Johnson Park, at the May 2, 2016 BOT Meeting. With over 50 years of service in support of Town's parks and recreation functions, more than 13 years served as a Trustee, and an active member and leader of countless community events and celebration committees, Mrs. LaVern has played a significant role in shaping Lyons to the community it is today. At the meeting, Mrs. LaVern was presented a custom chair created by local artists, exclusively for the former Trustee to sit comfortably at BOT meetings and other events at Town Hall. New signage for the park is being prepared. The Town is overwhelmingly grateful for Mrs. LaVern’s countless contributions, and is proud to be home of the LaVern M. Johnson Park. This week, the teams continue work on drainage and installation of conduits for street lights. The Railroad Ave., Evans St., and 2nd Ave. three-way intersect, off US-36, is now open to vehicular traffic. The long-awaited traffic signal will be operating in the near future. Once the traffic detection cameras are delivered and placed, the traffic signal will run with flashing red and yellow lights. See Sgt. Nick Goldberger's message regarding the new traffic control lights. Work for the Confluence Area Capital Improvement Project remains in a slowdown, as the remaining construction requires Xcel to relocate gas lines. Specifically, to work on the gas lines in the Hwy 7/5th Ave. right-of-way, Xcel must receive a permit from CDOT. CDOT has been notified of the timeline urgency, and told Xcel to expect a quick turn-around time. Upon relocating gas lines, project leads estimate roughly 2-3 more months of work, until the project is complete. The odor that may be detectable within the surrounding area of the wastewater treatment plant is expected to be resolved by Monday, May 9. The Town has been working with the contractor to retain the piece needed to contain the odor. The Town and associated contractors have been working diligently for quickest possible delivery of the part; we apologize for the unfavorable conditions. As the civil construction phase for the creek restoration project has been complete, revegetation and landscaping are still underway. To date, over three thousand willow stakes were planted along the creek banks, and initial seeding and mulching along the banks will occur by Spring run-off. At this stage, the young willows and seedlings are extremely vulnerable to damage - please allow time for the habitat to establish, by limiting activities in these environmentally sensitive areas. Following Spring run-off (expected June to August), crews will continue with the second phase of seeding and revegetation in the area. In April, the creek was stocked with trout in Meadow Park. On the advice of local trout experts, the fish will temporarily be fed natural fish food, until the aquatic habitat is reestablished. Please note that Meadow Park is still under construction and closed to the public. Thanks for your continued cooperation, as the trout get settled in their new habitat and the park continues to be built! Thanks to all who participated in last weekend's DEA drug take-back! It was a successful event that diverted more than 44 lbs of medications (includes containers)! The Boulder County Sheriff's Office will be holding another drug take-back, during the Spring Cleanup, later in May. More details to come. 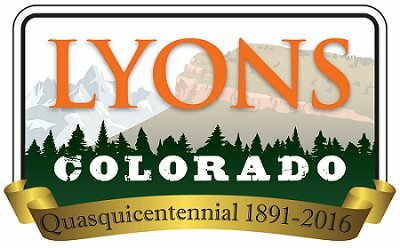 Lyons Last Thursdays / Art Walk is a celebration of the arts essence of Lyons, and an opportunity to expand commerce via a town-wide creative collaboration. All are invited to watch the Colorado Rockies play the Arizona Diamondbacks and support Lyons youth baseball/softball teams. A portion of each ticket goes to the Lyons Youth League to help fund the youth baseball/softball program in Lyons (uniforms, equipment, awards). Children participating in Lyons youth softball/baseball are invited participate in a parade at the start of the game. The players participating in the parade need to be at the game 1 hour prior to the game start. Time: 2:10 PM is game start time, must be there at 1:10 PM for those who wish to participate in the parade. Sign up and pay at Lyons Town Hall. Contact Lori LeGault with questions.